Linssen Yachts presented France Fluviale with the ‘Best Performing Dealer Award 2014’. 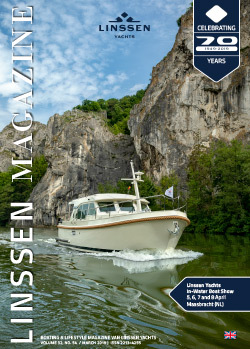 The international Linssen dealer meeting was held prior to the annual Linssen Yachts Boat Show at the end of November. This meeting is attended by all the national and international Linssen dealers from eleven countries. At the start of the event, several newcomers were introduced. Jeroen Opheij and Lars Franken have been appointed to support the sales department at the boat yard in Maasbracht. Added to which, there are new dealers in Turkey (Gena Yacht), Australia/New Zealand (EuroCanalBoat) and Sweden (Linssen Yachts Sweden). During the dealer meeting, the exceptional aspects of the new models were covered in detail and all new developments for next year were discussed. In addition, the results of the past year were considered and the trends and expectations for 2015 were reviewed. This occasion also marked the presentation of the ‘Best Performing Dealer Award 2014’. This year, the award for the best sales results went to France Fluviale. “I am already proud to be working with Linssen Yachts, so it is an enormous honour for me to receive the Best Performing Dealer Award 2014, especially because there are so many hard-working, experienced Linssen dealers. And, quite honestly, Linssen motor yachts are so good and of such fantastic quality that the boats almost sell themselves. So it’s actually the designers, the boat builders and all the other people at Linssen who deserve the award. In recent years, France has been gradually moving up the ladder in terms of sales competition. For this reason, an increasing number of Linssens are sailing in France and along the French coast. They attract attention and that is the best sales tool that a Linssen dealer could wish for. The Paris boat show begins on 6 December and I already have a whole pile of appointments with customers who want to see the two new models on show and want to know more about the attractive new Linssen deal. 2015 is already promising to become a great year for Linssen in France”, says Mike Gardner-Roberts of France Fluviale.